Shaheed Sukhdev College of Business Studies established by MHRD in 1987 in Delhi offers 4 full time 3 years bachelor degree programs namely, BMS, BBA FIA, BSc CS & BBS. 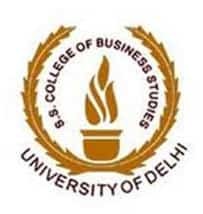 Admission into both program at Shaheed Sukhdev College of Business Studies done on the basis of DU JAT (Delhi University Joint Admission Test) which is conducted by University of Delhi. DU JAT application process will likely be started in the 2nd week of May 2018. The eligible candidates can fill and submit DU JAT application form online on the official website of the University of Delhi and also on this page below. The following full-time courses offered by Shaheed Sukhdev College of Business Studies are listed below, Admission to these colleges is conducted based on the DU JAT Scores of the candidates. The candidates seek admission into the BMS/BBA(FIA)/ programs must have passed class 12 examination or any other examination considered equivalent by the University of Delhi from the CBSE or any recognised board. The candidates appearing in class 12 examination or waiting for final result are also eligible to apply. The general category candidates should have secured minimum aggregate 60% marks in their class 12 examination in the subjects including English, Mathematics and other two subjects from the list of elective subjects as approved by the University of Delhi. The candidates belonging to OBC, SC, ST, PWD and CW category should have secured minimum 55% marks in class 12 examinations. Admission into the BMS/BBA (FIA) programs are done on the basis of DU JAT entrance test. Therefore, the candidates have to apply for DU JAT Application form which can be filled only through online mode on the official website of DU. DU JAT is a Paper & Pen mode entrance examination and will likely be conducted in the fourth week of June 2018. DU JAT Application Form 2018 will likely be available online on the official website from the second week of May 2018. To fill the DU JAT application form online, the candidates have to follow the guideline given in the DU JAT Application Form 2018. The candidates have to click the link given below for the guideline and steps for the application form. The candidates who will successfully submit the DU JAT application form will be able to download DU JAT admit card from the official website of the University of Delhi. Admit card will not be dispatched via post to the candidates. DU JAT Admit Card is a very important document for the whole admission process. The candidates will not be allowed to enter the examination hall without admit card. Admit card contains basic personal details of the candidates, date & time of the written test and venue details. Shaheed Sukhdev College of Business Studies has not released prospectus for admission 2018 in their programs BMS, BBA (FIA), B Sc. Computer Science, BBS) and B. Tech (Computer Science) yet. However, the candidates can check below the program fee details which are based on last year’s course fee structure. Foreign nationals have to pay Rs 6000 additional to the listed below courses. The candidates will be selected for admission into BMS/BBA(FIA) programs on the basis of combined weightage of DU JAT entrance examination result, marks scored in class 12 examination, performance in personal interview and group discussion. The candidates selected for admission will have to bring all required document and have to pay 1-year course fee during admission. A total number of seats in the program bachelor of management studies (BMS), bachelor of business administration (financial investment analysis) BBA (FIA) and B Sc. Computer Science in Shaheed Sukhdev College of Business Studies is as under.